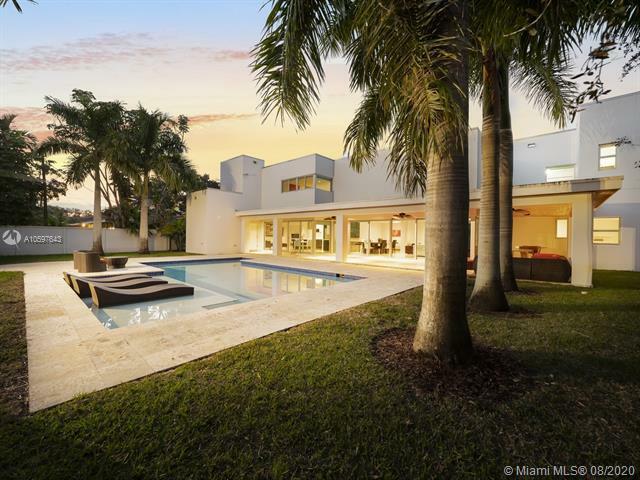 World class Resort Style Modern Estate with detached guest house in the Heart of Pinecrest. Enjoy a tranquil water feature as your approach your front door. This custom-built home, offers a fantastic architectural design providing an open and bright floor plan with grand scale entertaining areas. Exquisite details and finishes are appointed throughout from designer appliances, natural stone floors, spacious bedrooms each with built in California walking closet and great master suite with private foyer, spa bathroom and his and hers huge built-in closet. This home offers great space and accommodates most families with 8 Bedrooms, 8.5 Baths, home office, Gym, Sauna, Etc. The data relating to real estate for sale on this web site comes in part from the participating Associations of the Miami Multiple Listing Service. The MLS data provided for the property above (A10597643) is provided courtesy of (One Sothebys International Re). The information being provided is for consumers' personal, non-commercial use and may not be used for any purpose other than to identify prospective properties consumers may be interested in purchasing. Information is deemed reliable but not guaranteed. Data last updated on 04-21-2019.